The cornea is the “window” to the eye, a clear tissue through which light enters the eye and hits the retina. The cornea is extremely important to good vision and to good eye health. The cornea lacks any blood vessels and needs to be completely clear to maintain clear vision. The lack of blood vessels means that your cornea is more susceptible to disease. 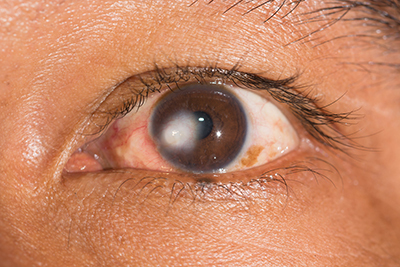 Some corneal conditions may need to be treated with a corneal transplant. At Berg Feinfield, we offer different types of cornea transplant to suit your specific needs. Sometimes, only a part of the cornea needs to be transplanted. Procedures such as Descemet’s stripping automated endothelial keratoplasty (DSAEK) and Descemet’s membrane endothelial keratoplasty (DMEK) are partial thickness corneal transplants. This type of transplant is common with Fuch’s Dystrophy patients. Full-thickness corneal transplants or Deep anterior lamellar keratoplasty (DALK) are commonly used for corneal scarring and keratoconus. Patients with keratoconus are good candidates for DALK as they are typically younger and experience less complication. If you have been told you are in need of a corneal transplant, Berg Feinfield has the experience and skill that you are looking for. Call today to set up your consultation!